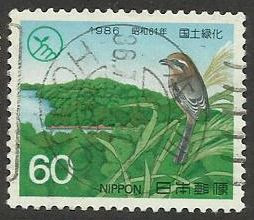 What a nice SON * cancel we have here from Honjo in Japan on a 1986, 60y Bull headed Shrike (Lanius bucephalus) which is a smallish bird of the shrike family Laniidae. These shrikes breed in north-east China, Korea, Japan and far-eastern Russia with some northern birds migrating southwards for a warmer winter. They feed on insects such as crickets and beetles and are also known to impale prey on a sharp point – usually thorns – so the food can be ripped easily into bite-sized pieces. *SON in philatelic terms means socked on the nose or in plain English a complete postmark over the centre of a stamp.